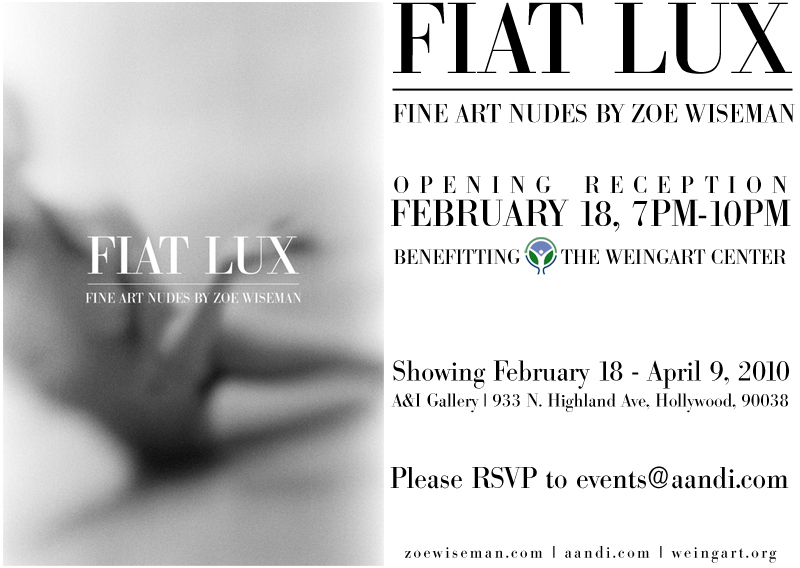 Zoe Wiseman will be exhibiting 10 years of fine art nudes at A&I Photographic in Hollywood. Opening reception is February 18, 2010, 7PM to 10PM. A&I will be producing a book for the show, as well as a special limited edition book titled Fiat Lux. 50% of all proceeds will benefit The Weingart Center. They help many people here in Los Angeles transform themselves from being homeless to productive members of our community.Â Zoe lived in downtown Los Angeles for a year at 4th and Main Streets directly in the midst of skid row in a refurbished artist loft. The brutal inhumanity of it all affected her. She has decided to give 50% of all proceeds to an organization which focuses on transforming these lives and helping them get off the street. A book signing, beer and wine bar, catered food and over 30 prints from several of her series. Models on the wall include; Ida Mae, Candace Nirvana, Jazmine Dominique, Natasha Kay, Marketa, Carlotta Champagne, Madame Bink, Muse, Kat Love, Ivory Flame, Stephanie Anne, Larva X, Rebecca Lawrence, Vassanta, Rei, Pash, Niecy Moss, Rebecca Fox, Jessamyne, Zinn Star, Soph and Maria Erickson. Please come out and celebrate! To keep up to date – please subscribe to Zoe Wiseman’s personal website feed. This entry was posted in Exhibitions, Fine Art Nudes, Published Work, Uncategorized and tagged A&I, art, artnudes, exhibit, exhibition, fine, gallery, nudes, photography, show.